“It’s a little off the rails right now,” The Voice sensation Sarah Grace said as she paused for a few moments between a schedule packed with vocal lessons, stage rehearsals, and school work. 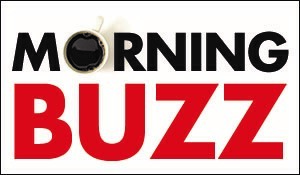 Even amidst the frenzy, this bubbly 16-year-old Houstonian remained cool and collected as she chatted over the phone from Los Angeles on Thursday afternoon, four days before her next live performance on Season 15 of NBC’s The Voice. Last week, in episode 20, Sarah Grace earned a spot on the show’s top ten by securing enough votes from fans across the country. 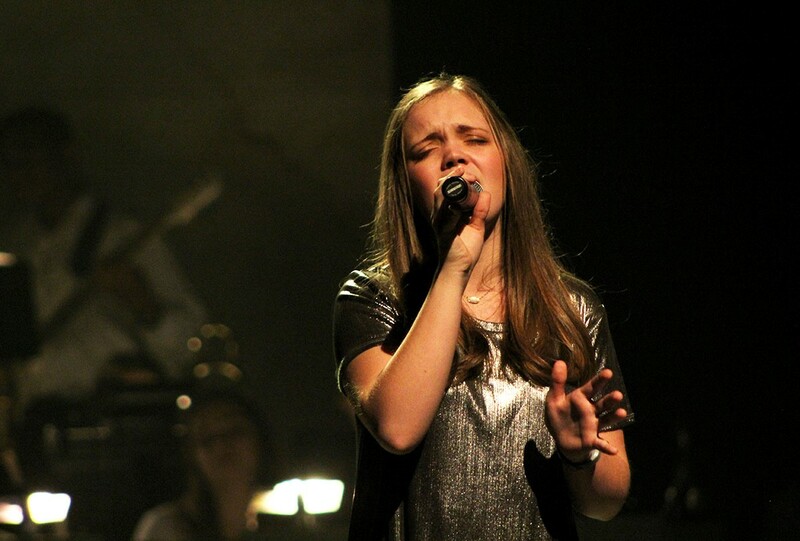 Aware of Sarah Grace’s singing talent, HSPVA passed along Sarah Grace’s information to The Voice last November. Since then, Sarah Grace successfully moved through multiple hoops to make it onto the show, which aired in September with Sarah Grace’s electric performance of “Ball and Chain.” That episode featured the “blind auditions” where the show’s judges — Kelly Clarkson, Blake Shelton, Jennifer Hudson and Adam Levine — had their backs turned and, based on the contestants’ voices, had to decide whether to turn around and become a potential coach of the contestant. During Sarah Grace’s performance, multiple judges turned around, and Sarah Grace selected Kelly Clarkson to be her coach. When Sarah Grace started the school year as a sophomore at HSPVA, she knew that she was a contestant on the show but had to keep this a secret from friends and classmates for weeks. 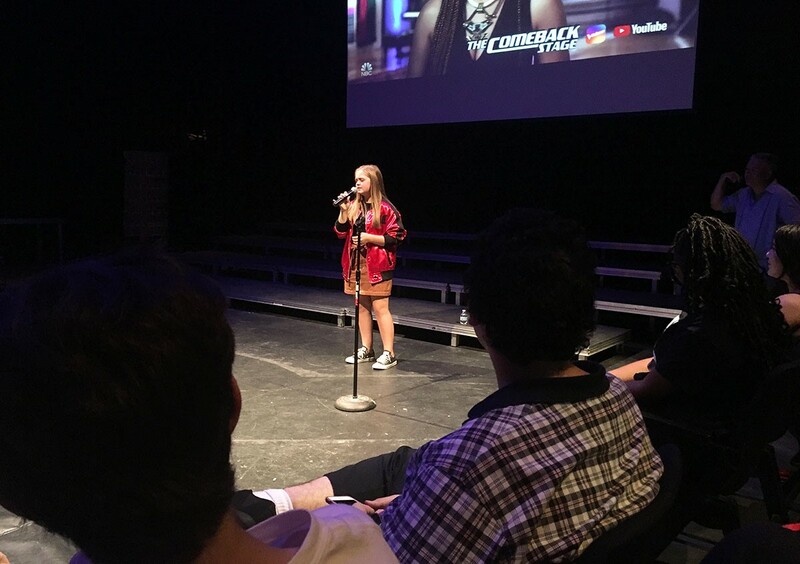 Finally, in September, Sarah Grace collaborated with school administration to hold a watch party for the show’s premiere on Sept. 24. Since then, the HSPVA hallways have been buzzing with talk about the show. She has also volunteered at events for prospective students, making them feel comfortable and welcoming them to the school, said HSPVA principal Dr. Scott R. Allen. As much as the school community loves Sarah Grace, Sarah Grace is equally grateful for the school community. 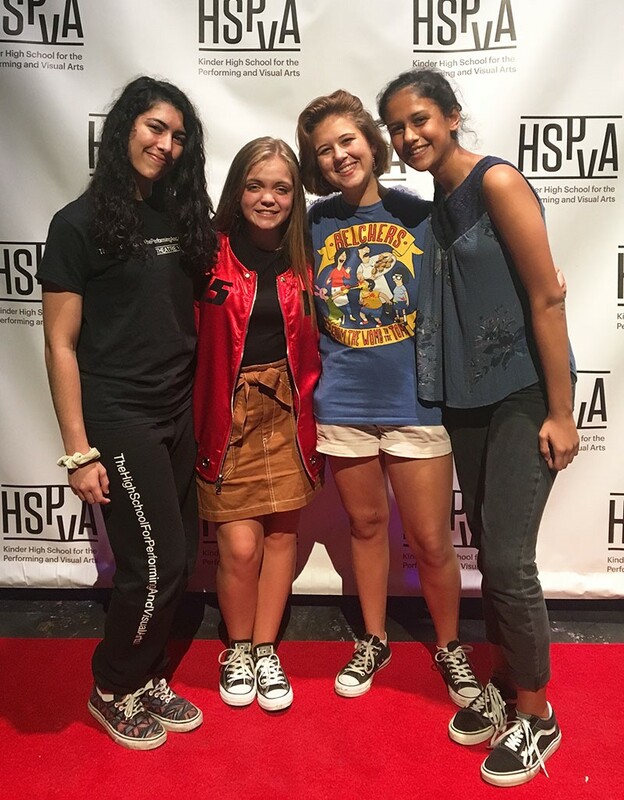 Sarah Grace said she dreamed of attending HSPVA ever since she first found out about the school back as a sixth grader at Westbrook Intermediate. The young artist says her inspiration for becoming a musician stems from her early childhood. She was born with synesthesia, a perceptual phenomenon where stimulation of one sensory pathway involuntarily stimulates another sensory pathway. For Sarah Grace, this manifested as chromesthesia, wherein hearing sounds automatically invoked an experience of color and vice versa. Sarah Grace said she no longer has this auditory-visual experience but that it is what originally what inspired her to create music. “Creating music was not only an auditory art but it was also a visual art,” she said. Sarah Grace donned her “Team Kelly” red jacket at HSPVA’s watch party of the premiere of The Voice. But Sarah Grace’s band has grown over the past several years. The band - Sarah Grace and the Soul - still includes Reagan Kimberly, 14, on the drums and also includes 17-year old Daniel Holder on bass. They play a mix of covers and original songs all over Houston and even have an original song, “What I Came For,” on Spotify. Sarah Grace considers herself a blues, rock, soul and roots artist “with a little bit of pop thrown in there.” She credits the Houston blues community for supporting her band for the past several years and opening up stages for her to perform on. For example, the Houston Blues Society sent the band to Memphis to perform at the International Blues Challenge. She has also continued to keep in touch with friends, keeping track of birthdays and school happenings, through social media. Sarah Grace’s father, a firefighter, is with her in L.A. She said that her mother, an audiologist, is rooting for her from Houston with her sister, who is now in eighth grade. “I love everyone’s support and I hope that I’m doing Houston proud,” she said. HSPVA students and faculty are certainly proud of how far Sarah Grace has already come. And they have organized a watch party - strictly for its students and family members - for Monday’s upcoming episode, airing at 7 p.m. CT.